Diesel locomotive 118 548 of the railway company of the German Democratic Republic (Deutsche Reichsbahn). At the time of the founding of the German Democratic Republic in 1949, the good, old railways still were paramount when it came to journeys over longer distances for the president and later the chairman of the state council and the members of the GDR government. 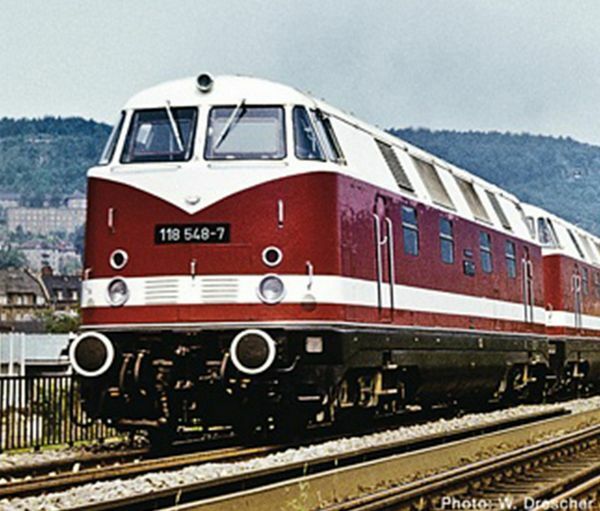 the diesel locomotives V 180 series built in 1964, later also designated BR 118, only three locomotives were used for the transport of the government train. The locomotives of the "Regierungszug" were always technically as well as visually well maintained. There were also some differences to her sister locomotives. The numbers on the locomotive plates and on all the handles were chrome plated.